I’ve spent a little more time than intended on my new wishlist tool, which is going to help me structure my further developments of Redblade 3.5 and Redblade CG. This means the Redblade CG release and Redblade 3.5 Open Sourcing will take a little longer. I’ll keep you posted! After reading up on all the pleading posts on the Redblade forums I’ve decided to release Redblade’s 3.5 source code into public domain, and Release CG as is. I would like it to become a successful open source project eventually, but for now I want to see if it has a chance. I’ve always found it hard to balance time between projects, social life, an work. Staying loyal to one project implies abandoning or at least pausing others, and Redblade CG and Redblade 3.5 have, in a way, fallen victim. I’ve been asked many times to complete Redblade CG, or at least release the source so others can complete it. Redblade 3.5 still has a nice user base and I would like to release the source as public domain eventually. It has reached its expiration date though, so beyond a few bugfixes I have no plans to change it, now or in the future. Redblade CG was very close to completion when I put it on pause, and I’ve always been irked by its non-release. Still I think it requires one or two months of attention before its fit for release, and that’s ignoring the whole D&D 4e debacle. I am considering an unofficial release now to see what people think; if it gains enough momentum I might be willing to put some effort in. 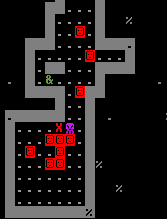 One thing I really like about Dwarf Fortress is laying out the perfect fortress. But it’s a time consuming job, so I added the ability to create chamber templates to see how it affects gameplay. 2. select a square area to use as a blueprint. 3. Use (+) and (-) to rotate the blueprint, (enter) and cursor keys to place. When doors and furniture become available we can add them to the blueprints, so when the room has been dug, it automatically creates placement orders. Store blueprints in a library for easy placement. It would be nice to tie this in to any thrall or illithid with architectural insight, more skill meaning bigger blueprints. Make the selection area blue with white. they are blueprints after all! Carrying and transporting items is a reality. Jummy, brains! When one of your min defeats an enemy, it becomes prone, allowing any flayer to enslave, slay or devour the target’s brain. I’ve also bumped creature life so fights take a bit longer than a single strike. Right now the only desirable options are enslave or devour, as devour heals a wounded flayer, and there is no penalty for enslaving. We will mend this in the future, when the player will have to balance thrall against resources and available flayers. Just a little update here. Enjoying their first victory, my flayer and its truste d frogman thrall wade in the heaps of gnome (and some flayer) corpses. The battle was intense.. and pretty boring. I miss some splatters of blood. I think we’ve got the exterminate part covered. Now to allow an in-between step. By adding a ‘dying’ state we can provide a window of opportunity to enslave. enslave: some creatures will rather fight to the death, while others will accept subjugation without complaints. In all cases, the creatures must be in a vulnerable or obedient state before they can be enslaved. impregnate: same preconditions as enslave, just needs to be in the brain chamber. eat: Flayers eat brains. Thralls are fed other thralls. I’ll allow flayers eating severed brains to survive, but to avoid a negative thought they’ll have to eat directly out of a skull ever so often. Same preconditions as enslave, with the side note just harvesting the brain would provide some sustenance as well. trade/diplomacy: Hey, wanna trade this brain for your mirror? 😀 Or: gimme 100 gold or I’ll eat your brain. Needs at least a non-hostile creature. exterminate: requires swatting a target until it is dead. Approach a Thing (creature or object) [until in weapon range]. Attack a creature [until dead] [until incapacitated] [until scared away] [until mentally beaten] [with weapon]. Transport a Thing to location. Order a creature to location. Relationships between Flayers and the various towns and species. Some species are natural enemies, others tolerate flayers or collapse into crying heaps of brain the moment Flayers appear. Basic object and inventories. If possible the first stockpiles. Better system to handle actor-centric (timmy pick up that stone) or target-centric (someone attack that dwarf) orders.